There is nothing that comes close to the unfavorable feelings that are generated by an inanimate object living in our kitchen. We've been together for about nine and one half years, but when you combine your things together with your significant others things everything changes. It's like suddenly all the stuff I love is mixed in with all this other stuff I don't love. My shoes and fabric soon became intermingled with hard drives and circuit boards. I embraced the extra electronic bits, and he had the idea for a wall with pink paint and hooks to hang and display my purses like art. Part of my kit came along with hangers, because somebody brought all his clothes without any hangers and showed up expecting me to furnish his closet with all the hangers he would need because duh, I'm a chick and I must be overflowing with hangers, and one very regularly used appliance. This toaster was a purchase my parents made when I was a small child. It was so exciting when we got it I vividly remember its arrival into our home. 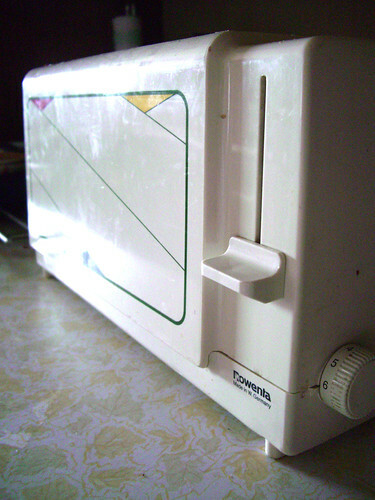 It was modern and German and so cool because it had a grilled cheese sandwich maker. Apparently Thomas does not have the same attachment to said toaster. He can't get the button to stay down, he thinks its ugly, and he SWEARS it will burn the house down when it is put away in the cupboard unplugged. He also points out the fact that it doesn't say "Made in Germany" but rather "Made in W. Germany." OK, maybe we'll get a new one with the Target gift card wedding present. But I won't like it!